Designed for versatility and high performance, the Lake Shore Model CRX-4K is our premium cryogen-free closed cycle refrigerant probe station. This system is the solution for those looking for the convenience of cryogen-free operation and the exceptional measurement performance of a Lake Shore product. Using a self-contained closed cycle refrigerator (CCR), the station will cool down to cryogenic temperatures unassisted, eliminating the need for monitoring by the researcher. 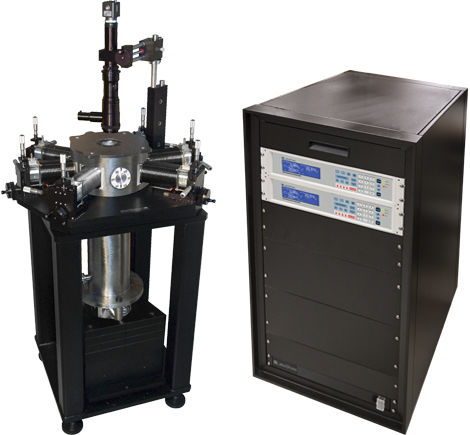 Various options and configurations on the CRX-4K enable the researcher to conduct exacting, challenging test measurements. The CRX‑4K provides Lake Shore’s best low-temperature cryogen-free performance, with configurations enabling sample temperatures as low as 4.5 K. Multiple temperature sensors throughout the station ensure accurate, repeated measurements. Please fill out our request form to let us know your system requirements. A Lake Shore sales representative will get back to you in 24 to 48 business hours.